April Kennedy...My Life + My Style: OH YEA...WE ARE EATING HEALTHY TONIGHT! OH YEA...WE ARE EATING HEALTHY TONIGHT! 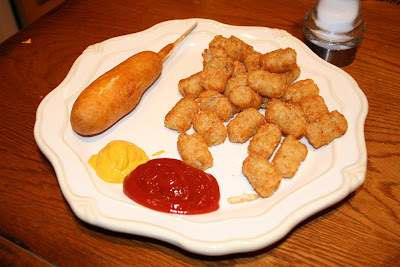 Corn Dogs and Tater Tots....yummy! I have been irrational all day, a little down, craving salt and fried foods. PMSing you might ask? Poor Dave....he didn't stand a chance every time he called me today. I'm sorry hunny. It is only going to last two more days. I really do love you. Hope you like this classy dinner. It looked so good at Target! LOL I can't tell you how many days we've had like that. It actually looks pretty good to me. We had left over pulled pork sandwiches and nothing else at our house. I did't even bother to get out some chips or make a salad. I guess it was a sad night for cooking all around. Hey, I have an article I want to show you, so don't be surprised if I show up at your doorstep sometime soon with it. HAHAHHAA!!! We had tater tots and chicken nuggets!!! I sooo wish I had corn dogs instead though! :( The few things I want being pregnant: Turkey sandwich and corndogs... can't have either. Guess what I'm having delivery day! ?